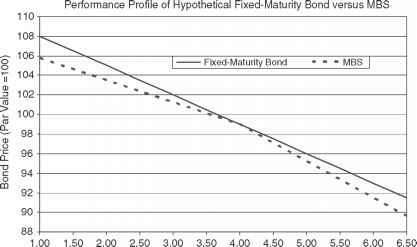 Holders of fixed income investments ordinarily deal with interest-rate risk, or the risk that changes in the level of market interest rates will cause fluctuations in the market value of such investments. Under most circumstances, interest-rate risk can be hedged through either the cash or derivative markets. Mortgages and associated MBS, however, have additional risks associated with them that are unique to the products and require additional analysis. In the following discussion for the sake of clarity, mortgages and MBS collectively are referred to as pools. In a previous section it was noted that mortgage obligors generally have the ability to prepay their loans before they mature either by selling the property or by refinancing the loan to lower their interest rate or monthly payment. For the holder of the mortgage asset, the borrower's prepayment option creates a unique form of risk. In cases where the obligor refinances the loan in order to capitalize on a drop in market rates, the investor has a high-yielding asset payoff that can be replaced only with an asset carrying a lower yield. Prepayment risk is analogous to "call risk" for corporate and municipal bonds in terms of its impact on returns, and it also creates uncertainty with respect to the timing of investor cash flows. In addition, changing prepayment "speeds" owing to interest-rate moves result in variations in the cash flows of mortgage pools, strongly influencing relative performance. While CPR is the most common metric used to describe prepayments, other conventions are also used. 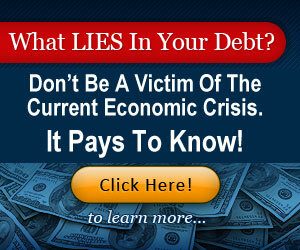 Logic suggests, for example, that prepayment behavior is not constant over the life of a loan. Immediately after the loan is funded, for example, a borrower is unlikely to prepay his or her mortgage; however, the propensity to prepay (for any reason) increases over time. This implies that prepayments generally follow a predictable pattern after the pools are issued, where the CPR increases at a constant and predetermined rate (referred to as a "ramp"). The most common model for measuring prepayments in a ramping framework is the so-called PSA model, created by the Public Securities Association (now called the Bond Market Association). 30. At that point, prepayments remain at 6% CPR for the remaining term of the loan or security. Based on this convention, 200% PSA implies speeds double that of the base model (i.e., 0.4% in the first month ramping to a terminal speed of 12% CPR in month 30). Exhibit 1-9 shows a graphic representation of the PSA model. 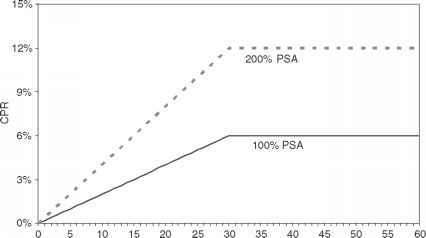 The PSA model depends on the age of the loan (or in a pool, on the weighted-average loan age). For example, 4.0% CPR in month 20 equates to 100% PSA, whereas 4.0% CPR in month 6 represents 333% PSA. Conversely, the usefulness of the PSA model (or other models of a similar nature) depends on the accuracy in forecasting the "ramping up" of prepayments. Empirical data suggest that prepayment ramps have shortened over the last decade, reflecting the lowering of refinancing barriers and costs. In turn, this arguably has distorted the reported PSA speeds for loans that are 30 months old or less, making the PSA model less useful as a measure of prepayment speeds. Prepayments attributable to reasons other than refinancings are referred to under the broad rubric of turnover. Turnover rates tend to be fairly stable over time but are influenced by the health of the housing market, specifically the levels of real estate appreciation and home resale values. Refinancing activity, however, generally depends on being able to obtain a new loan at a lower rate, making this activity highly dependent on the level of interest and mortgage rates. In addition, the amount of refinancing activity can change greatly given a seemingly small change in rates. The paradigm in mortgages thus is fairly straightforward. Mortgages with low note rates (that are out-of-the-money, to borrow a term from the options market) normally prepay fairly slowly and predictably. However, the predictable behavior of out-of-the-money mortgages can be influenced by real estate appreciation as obligors seek to tap accumulated equity in the absence of any interest rate declines. Loans with higher rates (in-the-money) can experience prepayment spikes when rates drop, as well as significant volatility in prepayment speeds. Owing to changes in prepayment rates, mortgages and MBS exhibit price performance that generically is referred to as negative convexity. Since prepayments increase when rates decline, MBS shorten in average life and duration at precisely the time when they would benefit from extending. Conversely, when the bond market sells off, prepayment "speeds" are reduced, subsequently causing MBS average lives and durations to lengthen. This behavior causes the price changes in mortgages and MBS to be decidedly nonlinear in nature and to underperform those of assets that do not exhibit negatively convex behavior. Exhibit 1-10 shows a graphic representation of this behavior. Investors generally are compensated for the lagging price performance of MBS through higher base-case yields. However, managing negative convexity and prepayment risk on the part of investors dictates active analysis and management of their MBS portfolios. In particular, MBS investors must be cognizant of the impact of fluctuating interest rates and exogenous changes in consumer prepayment behavior on their investment practices. Lenders that hold mortgages in the form of loans need to assess the credit quality of portfolio holdings and the adequacy of loss reserve levels. Buyers of subordinated securities (i.e., securities in a multiclass structure that protect other classes from experiencing losses) need to evaluate potential loss-adjusted returns. An evaluation of the health of consumer finance and mortgage companies requires an understanding of trends in mortgage lending and credit quality. In a previous section, some of the factors (credit scores, LTV ratios, etc.) that are used by lenders to gauge the creditworthiness of borrowers and the likelihood and severity of loss in the event of default were discussed. 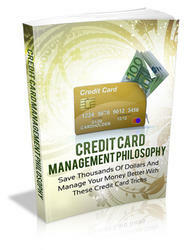 Many of the same measures are also used in evaluating the creditworthiness of a mortgage pool. For example, weighted-average credit scores and LTV ratios are calculated routinely, and stratifications of these characteristics (along with attributes such as documentation style and geographic concentration) are used in the credit evaluation of the pool. In addition to these attributes, the following metrics are also relevant for the a posteriori evaluation of a mortgage pool. A somewhat more stringent classification is recommended for use by the Mortgage Bankers Association (MBA), which classifies a loan as 30 days delinquent once payments are not received after the due date. Therefore, a loan classified as "current" under the OTS method would listed be as "30 days delinquent" under the MBA method. At some point during existence, many delinquent loans resume timely principal and interest payments as the condition leading to the delinquency (e.g., job loss, illness, etc.) is resolved. However, some portion of the delinquent loan universe ends up in default. By definition, default is the point where the borrower loses title to the property in question. Default generally occurs for loans that are 90+ days delinquent, although loans where the borrower becomes bankrupt may be classified as having defaulted at an earlier point in time. Defaults can be quantified in a number of ways. The conditional default rate (CDR) is the annualized value of the unpaid principal balance of newly defaulted loans over the course of a month as a percentage of the total unpaid balance of the pool at the beginning of the month. The cumulative default rate (sometimes referred to as the CDX to avoid confusion) is the proportion of the total face value of loans in the pool that have gone into default as a percentage of the total face value of the pool. Default rates are highly dependent on the characteristics of the loan in question. For example, prime loans generally have cumulative default rates in the area of 1.0% to 1.5% after the first five years, whereas cumulative defaults on subprime loans can exceed 8.0% over the same period. The appraised value of the property may be high relative to actual market value. There are costs and lost income associated with the foreclosure process. In addition to loss-adjusted returns, credit considerations also affect the prepayment performance of different sectors of the mortgage and MBS markets. For example, subprime and credit-impaired loans are assumed to exhibit relatively fast out-of-the-money prepayment speeds owing to elevated levels of so-called involuntary prepayments. These occur as a result of the impact of defaults and foreclosures (since a foreclosure generally is treated as a prepayment, with the recovered principal passed on to investors), as well as property sales resulting from either financial distress or an effort on the part of lenders to reduce the obligor's financial burden. The GSEs traditionally have served a dual role for the mortgage and MBS markets. As noted in previous sections, the GSEs (as well as Ginnie Mae, a true "agency") provide credit support to loans that meet eligibility requirements. In addition, the GSEs also hold sizable portfolios of MBS and mortgage loans that are held as investment vehicles. These positions are funded through the issuance of debt securities of various structures and maturities, including bullet and callable debt. The business purpose of these portfolios is similar conceptually to that of a depository, in that the corporations hold the investments and earn a spread over their (presumably) cheaper funding. Portfolio purchases also serve the ancillary function of providing demand for the MBS sector when the sector cheapens, reflecting the unique symbiosis between the market and the GSEs. Wider MBS spreads provide profit opportunities for the GSEs; purchases by the GSEs serve to stabilize spreads and provide support for the MBS market. In this sense, the role of agency mortgage portfolios is analogous to the role of domestic and international central banks in providing support for the U.S. Treasury debt markets. Over the past decade, agency portfolios have exhibited dramatic growth. Exhibit 1-11 shows, as of the end of the calendar year, the size and annual growth of the retained portfolios of Freddie Mac and Fannie Mae. Traditionally, the bulk of their portfolio acquisitions has been in fairly straightforward MBS pools. However, a recent development has been increased purchases of private-label securities backed by alt-A and subprime loans. The portfolio growth of the agencies has, at this writing, become a fairly thorny political issue, kindling worries that the size of the agency portfolios creates risks for the stability of the financial markets. This issue, along with several episodes of accounting concerns involving both Freddie Mac and Fannie Mae, also has generated proposals for more stringent regulation of the GSEs. Some proposals include moving their primary regulation from HUD to the Department of the Treasury. One likely result of the controversy is that the GSEs' portfolio growth will be more muted in the future, with the "guaranty" side of the business becoming the growth engine for both firms. During times of market instability, the GSEs may not be able to provide the level of support and "ballast" for the MBS market that has existed in recent history. Past instances of market instability (e.g., the Russian debt default and the subsequent Long-Term Capital Management insolvency) have been met with aggressive GSE portfolio purchases. As future portfolio growth is constrained, the ability of the GSEs to provide support to the MBS market may be more limited. To the extent that lack of such support results in wider MBS spreads, the eventual mortgage rate charged the consumer might be adversely affected. Levels of GSE demand will have an impact on pricing of products that are not traditionally associated with agency portfolio activity, such as conforming-balance ARMs and subprime and second-lien products. Reduced GSE portfolio growth may have an unanticipated positive impact on the MBS market by reducing demand for hedging instruments. Demand for options and other hedging vehicles tends to negatively impact the mortgage market by increasing the value of the options embedded in mortgages. To the extent that demand for these instruments is reduced, mortgage spreads are likely to tighten. The GSEs traditionally have acquired significant quantities of mortgage products through the so-called cash windows. This channel is used to purchase conforming loan production of smaller lenders that do not have the infrastructure to create and distribute MBS pools. To the extent that slower portfolio growth mutes demand for such production, smaller lenders may have an increasingly difficult time remaining competitive, and this may presage renewed consolidation in the mortgage industry. This expected evolution of the role of the GSEs suggests that the guaranty side of the GSE businesses will, by necessity, become the primary engine of their earnings growth. This, in turn, leads to the conclusion that the type and number of products guaranteed will continue to expand, particularly in sectors such as ARMs, where the GSEs' menu of credit insurance products is not comprehensive. As such, this is expected to lead to homogeneity in less liquid markets, thereby eventually leading to improved pricing for consumers. How mortgage prepayment affect performance? How is convexity with respect to mortgage backed securities influenced by prepayment risk? Did mortgage backed securities spread risk? What are the risk associated with mortgages? What risks are associated with mortgages and mortgage backed secirities? 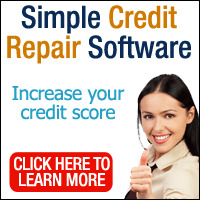 Why is mbs monthly payment not constant under 0 cpr? How to assess risk associated with mortgage? Does cpr include principal amortization? What effects the performance of mortgage backed securities?